Are you looking for a fun way to take advantage of Halloween and announce your pregnancy? There are so many fun ways to make super cute & creative Halloween pregnancy announcements! Read on for a few of my personal favorites. Congrats on your little bun in the oven! Not everyone can use holidays to let everyone know they are adding a little one to the family. This part is so fun because you can do anything and with Halloween coming up, you have even more fun options. 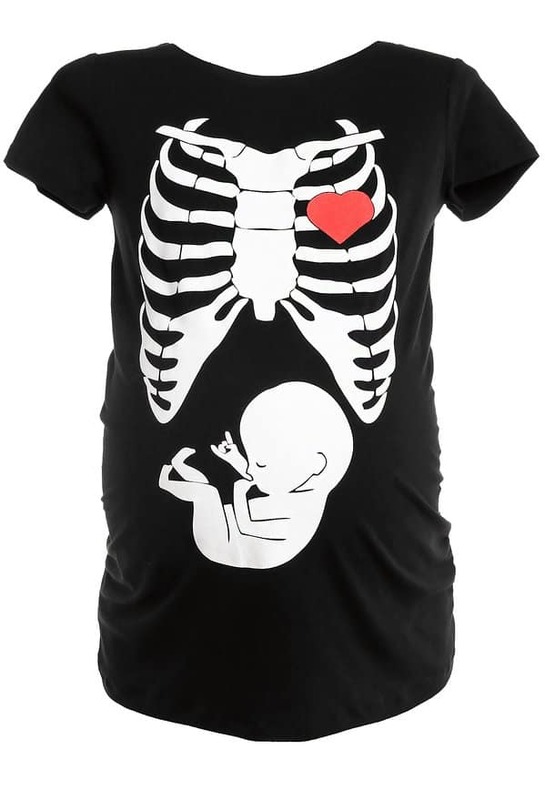 Have you seen those super cute shirts that depict a rib cage and then a little baby hangin’ out? You are in luck! With it being Halloween time, you can also find those skeletal shirts for the rest of your family. Take a bunch of different family shots and choose the best one. I don’t mean in a ball gown and tux (although you could, but I don’t think that will get your message across). You can be dressed as if you were having an X-ray done on your belly, and show a little one in there, and your hubby can be dressed as a doc. Or you can create the play on words ‘Bun in the Oven’ and you can be dressed as an oven with a bun in it, and your man can he the chef. You can find the oven costume at Costume Express or someplace. If gore is your thing, you can do what I did and make it look like the baby is coming out of your belly! I had to get permission from my daughter first, but I used one of her old dolls and cut off the arms and legs and fastened them to an old white shirt. I used fake blood around the limbs where they were coming out of the shirt. If photos are not your thing, but you still want to announce your pregnancy, just say it with words. It being Halloween allows you to use the word ‘mummy’ in a fun way! You can say something like ‘This Halloween, I am a Mummy-to-be!’ or ‘We are excited to say, our own little pumpkin is on the way!’ Include your expected due date on whatever you choose to say. Hopefully, this list of Halloween pregnancy announcements ideas will get the wheels spinning and you can create a one-of-a-kind announcement for your one-of-a-kind baby. If you are looking for a little more inspiration, check out this article from Today! 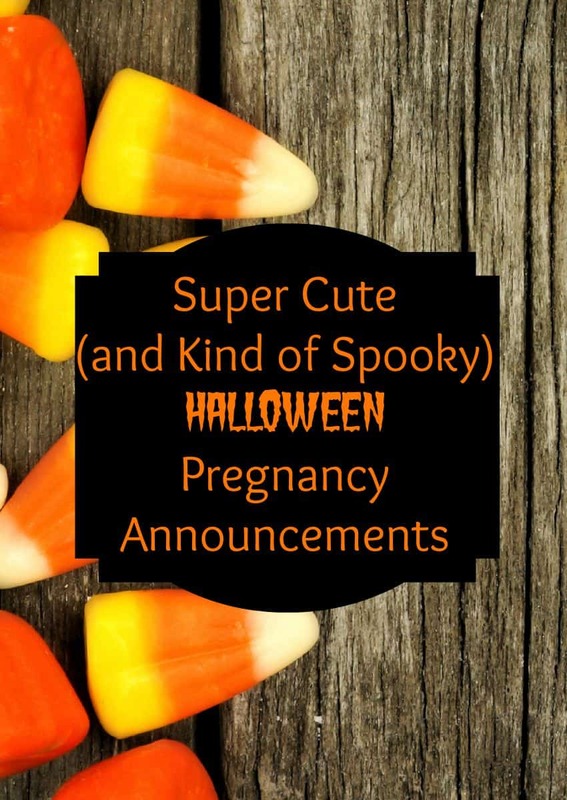 Do you have some fun and creative ideas on how to announce your pregnancy Halloween style? Share them with us below! Book Review: Kathryn the Grape’s Colorful Adventure. I kind of like the shirt. It’s cute and pretty much gets the message out loud. Such cute ways to dress up and let others know your expecting. The bun in oven is classic. How adorable! I love the bun in the oven costume, very perfect! Those are so creative and I never would have thought to do it on Halloween! That costume is too funny. I like the cute sayings with the pumpkins so many creative ways to announce . What cute ideas!! Love the oven costume! So fun! They think of everything don’t they? Too cute and funny! I do not celebrate halloween but I love the t-shirt! Perfect to wear anytime not just halloween. You had me at Bun in the Oven. THAT costume is hysterical and where was it when I was pregnant three times, it is so cute! These announcement ideas are awesome. I just love that bun in the oven costume. I love the “bun in the oven” costume. That is cute! I can just imagine the surprise of the family and friends who’d see it. I have to show this to my friend who is hoping to get pregnant before the year ends. Aweeee how wonderfully special and cute! So many wonderful ways to announce a Halloween pregnancy! I love how creative people are becoming these days! Haha absolutely loved this post! Such cute and creative ways to announce a pregnancy! Will definitely keep them in mind when I am expecting!